Set along the rugged beauty of the South Australian coast, Storm Boy cares for an injured pelican and finds a friend that shows him the power of loyalty and love. This moving story is now a major motion-picture and one of the classics of Australian writing for children. This edit... read full description below. 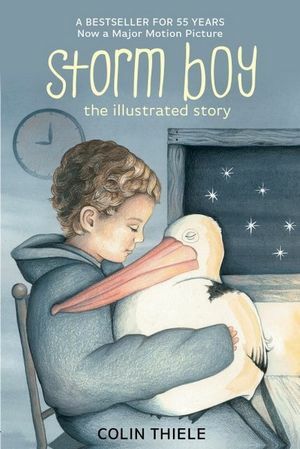 Set along the rugged beauty of the South Australian coast, Storm Boy cares for an injured pelican and finds a friend that shows him the power of loyalty and love. This moving story is now a major motion-picture and one of the classics of Australian writing for children. This edition comes with five other stories by Colin Thiele that capture the unique voices of Australians across the natural and suburban landscape. The Water Trolley- Paul knew the vastness and emptiness of the land around him. Paul understands the delicate balance of nature. Through his eyes, readers will fall in love with the sharp vulnerability of the bush. The Lock-Out - The first disaster occurred at the end of Mr Hecht's science lesson. With his parents away in Melbourne, Jim expects a fun break but a series of unfortunate disasters sets in a motion an unforgettable weekend. Dad Ran A Fowl Run - Dad kept fowls once and I'll never forget it. Aveling's dad has ambitions to get rich off of raising a small army of hens and roosters but things turn crooked for Aveling and his dad's big plans. The Shell - Everywhere great columns of white spray rose as if in slow motion... Two travellers realise the terrible beauty of the ocean and the harrowing consequences for those who look away. The Fish Scales - He was five feet long! King of all snappers... A tale of struggle much like that of Ahab, that captures a light-hearted battle between man and nature. RIP 16.11.20 - 4.9.06 - Colin Milton Thiele AC was an Australian Educator and author of more than one hundred books, which have won him worldwide acclaim and admiration. He was renowned for his award-winning children's fiction, most notably the novels Storm Boy, Blue Fin, the Sun on the Stubble series, and February Dragon.